In this guide, we will learn how to work with Pointers and arrays in a C program. I recommend you to refer Array and Pointer tutorials before going though this guide so that it would be easy for you to understand the concept explained here. In the above example I have used &val[i] to get the address of ith element of the array. We can also use a pointer variable instead of using the ampersand (&) to get the address. 1) While using pointers with array, the data type of the pointer must match with the data type of the array. because the array name alone is equivalent to the base address of the array. 3) In the loop the increment operation(p++) is performed on the pointer variable to get the next location (next element’s location), this arithmetic is same for all types of arrays (for all data types double, char, int etc.) even though the bytes consumed by each data type is different. You must have understood the logic in above code so now its time to play with few pointer arithmetic and expressions. We don’t need the p++ statement in this program. 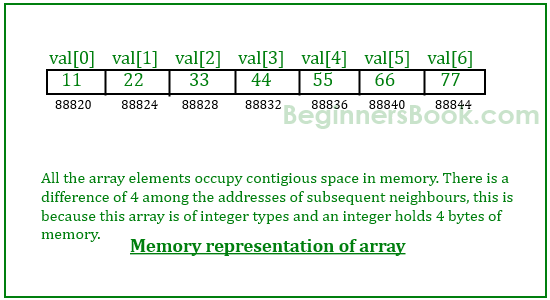 Reason: as for a 2D array val refers to address of 0th element of 2D array, which is a 1D array. p = &val, means you are assigning address of 1st element of array(at 0 position) to variable p, whereas p = val means you are assigning value of 1st element to variable p.
No malloc for your pointer p ?